Generally: No Rack = No Want! This is the final entry in this series: Shooting spikes while hunting whitetail deer. What’s Most Important – Nutrition, Genetics or Age? This is like asking which is more important: the digestive, circulatory or respiratory system? All three are critical to the life of a human. Life cannot be maintained without any one of these processes. 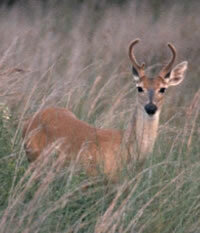 Deer need good genetics, good nutrition and to be of sufficient age to reach their potential. Since ‘a spike is a spike,’ he isn’t going to turn into a 16 point deer with good nutrition and age. Texas Parks uses a term – “improper harvest.’ In this category, they include “over-harvest of older age class males.” By making yearling spikes the main goal of a hunter’s aim, it takes pressure off of the older, fully-antlered bucks. Unfortunately, does do not have “I carry spike genes” or “I carry antlered genes” stamped on their foreheads. Besides targeting spike yearlings, Texas P&W suggests, older does should be removed from the gene pool. By removing these mature does, the balance between food availability and herd size would be stabilized. With more nutrition, there would be fewer fawns – with greater chance of survival. Males, because they mate with many does, have more influence on the gentetics of a herd. By removing the young spikes, potentially, more antlered deer join the gene pool. Since the older does (more likely to carry ‘spike genes’) are removed, eventually, the herd will have more antlered deer. Every hunter’s group will have someone tell about the ‘Spike that Grew a Huge Rack.’ They do happen; however, it can take years, and he still carries the spike genes. What do you think? If your state made these rules binding in your state (for x number of years), how would you feel about it?